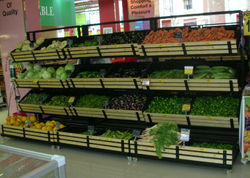 Prominent & Leading Manufacturer from Chennai, we offer fruits & vegetable racks. Merchandising A3 poster frames provide an attractive display solution for your fruits and vegetables. Easy accessibility of produce displayed at all levels considering the average height of people at 1408 MM. All levels of crates/shelves in which the produce is stored are visible at 1408 MM. Provision for the branding of all types - Mirror, Acrylic, foam board, sticker/banner. The most unique foldable plastic crates can be directly used for display at retail outlets and for economical transportation.